In 2018, as in many previous years, the West Coast of Florida has experienced large expanses of "red tide"— blooms of the toxic alga Karenia brevis. The past 11 months have brought millions of dead fish washing up on beaches, as well as hundreds of manatees, turtles, and other marine animals. As a result, many people are asking whether anything can be done to control or stop this harmful algal bloom (HAB). A new project, supported by the Florida Fish and Wildlife Commission, seeks to test a bloom control technology that has not yet been used in the United States, but that is used elsewhere in the world. The method involves a modified clay mineral that, when dispersed into the ocean surface, binds with red tide cells and the toxins they produce and carries them to the seafloor. This concept is new for many people, so the following list of questions and answers has been prepared to inform those who are interested in the goals and details of the project. Clay is a naturally occurring mixture of fine-grained minerals commonly found on land as well as in lake and ocean sediments, but that can also be found floating in the water from the surface to the seafloor. There are many different types of clay, with different structures, chemical compositions, surface electrical charges, and other properties. Clay minerals typically form over long periods of time as a result of the gradual physical and chemical break-down of rocks. Clays are especially common in coastal waters such as estuaries, deltas, and deep basins. Because ocean sediments often contain relatively high percentages of clay, many marine organisms are accustomed to living in clay-rich bottom sediments, or to occasional periods of murky water caused by clay particles entering the ocean in rivers or stirred up from the bottom during or after storms. Humans have mined clays for much of the history of civilization for use as building materials and ceramics, and more recently, clay has become an important part of many industrial processes. They are also an important part of products such as plastics and some food items and are commonly used in anti-diarrheal medicines and to soothe upset stomachs. For this project, a modified clay (see below) will be used in experimental studies. How does clay bloom suppression or remediation work? 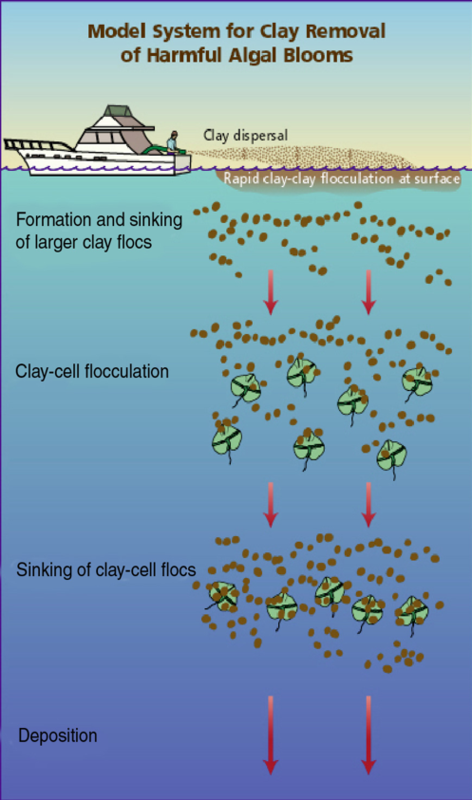 As shown in Figure 1, when sprinkled on the surface of the water during an algal bloom, the tiny but dense clay particles will “flocculate” or combine with other particles in the water, including the red tide cells. The process of flocculation is common in drinking water and sewage treatment. As these aggregations, known as “flocs,” grow, they sink through the water until they reach the bottom. As these flocs fall, they capture additional particles, clearing the water as they descend. In some cases, as with the fragile cells of the Florida red tide organism Karenia brevis, the flocculation and sinking process can rupture cell membranes, killing the cell. In deeper water, darkness, prolonged contact with the clay, and eventual burial in sediments on the seafloor can also kill the algae cells. Can red tide cells escape from the clays? All clays are different in terms of surface charge and their ability to adhere to algae cells. In addition to surface charge, flocculation is affected by factors such as particle size and shape and the physical forces that bring particles together. Likewise, algal species vary in their susceptibility to removal using clay flocculation because of their different surface properties, shape, size, and swimming ability. In studies of the Florida red tide organism Karenia brevis and related HAB species, clays have been very effective in removing cells from the water with no re-emergence up to 48 hours after clay control experiments in the laboratory, suggesting that the cells are either dead or incapable of escaping from the clay floc. The clay to be used in the experiments for this project (see below) have been highly effective in preventing deposited cells from re-emerging in other places it has been applied. Has clay control of algal blooms been used before? The practice of using clay to control algal blooms in the ocean is not new, with mentions in scientific literature dating back 30 years or more. Today, both South Korea and China routinely use clay to control algal blooms. In South Korea a clay called “yellow loess” has been used since 1996 to control blooms of a HAB species called Cochlodinium polykrikoides that have caused millions of dollars of damage to fish farms. Figure 2 shows the amount of clay used in in South Korea from 1996 to 2007. In some years, up to 225,000 tons have been used. Many environmental studies conducted in South Korea have produced no significant negative impacts, leading to the adoption of clay dispersal as a routine element of HAB management in South Korea. The Chinese have use clay to control algal blooms for over 20 years. Applications have ranged in size, with one treatment immediately prior to the sailing events in the 1998 Summer Olympics in Qingdao covering 38 square miles. In total, more than 20 large-scale clay treatments have occurred along the coast of China and there are also ongoing, routine bloom control programs such as one that that keeps the cooling water intakes of a nuclear power facility clear of blooms. A review of these field applications, as well as studies of environmental impacts is available here. How is the clay dispersed? Dry clay is typically suspended in seawater to create a slurry and sprayed over a bloom with pumps and hoses. The vessels used in support of these efforts vary widely. 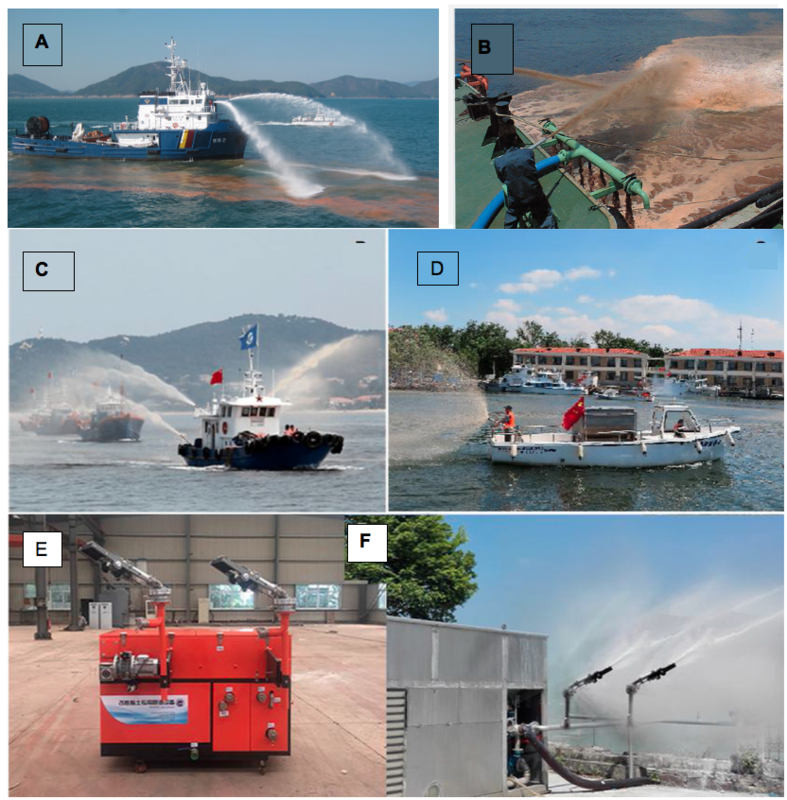 South Korea has seven large vessels devoted to HAB control, and these either spray the clay from large hoses or the clay slurry is dispersed from manifolds at the rear of the vessel. In China, there are also large vessels that are designed and outfitted exclusively for clay dispersal, as well as smaller boats that are used for more limited applications, but also dedicated to clay dispersal. There are also portable spray units resembling the generators found at construction sites. These are designed to be more mobile, and can be used from any type of vessel with sufficient deck space. Figure 3 shows the various types of vessels used for application, as well as a portable sprayer. Note that since the Chinese modified clay is as much as 50 – 100 times more efficient than the Korean clay, much less material is being dispersed in panels C, D and F compared to panels A and B. Figure 3. Ships and machines for dispersing clay. A. South Korean vessel spraying clay; B. South Korean vessel with large manifold at the rear of the ship for clay dispersal; C. Chinese vessels spraying clay; D. Small boat designed specifically for clay dispersal in China; E. Portable, self-contained machine to mix and spray clay; E. Larger Chinese spray system aboard dedicated clay dispersion vessel. Note the difference in the amount of clay sprayed in these different systems. Has clay control ever been tested in Florida and what were the results? In 2004, scientists from the Woods Hole Oceanographic Institution (WHOI), Mote Marine Laboratory, the National Research Council of Canada, and the EPA worked together to test the effectiveness of various clays for removal of red tide cells and toxins from the water and to study any potential environmental impacts. This involved a series of laboratory and field studies. The results from that study can be found here. To summarize that work, a by-product of phosphate mining known as phosphatic clay was found to be the most effective of the clays tested in removing red tide cells and toxins from the water under controlled laboratory conditions and in small field tanks or larger simulation tanks known as mesocosms. In terms of water quality, temperature, salinity, dissolved oxygen, and pH exhibited nearly identical patterns through time for both the control and the experimental sites, suggesting that the addition of clay did not affect these parameters. However, a noticeable reduction in oxygen was observed at all sites on the second day after the clay addition. This effect likely reflects the lack of water exchange in the mesocosms. The clay that carried red tide organism and their toxins to the seafloor had no negative impact on animals that live there. In fact, the number of animals in the clay-treated mesocosms increased by 121% following treatment, compared to an increase of 56% in the controls. However, the benthic community was in a stressed state due to the red tide itself, so the results of these studies are considered indeterminate, and worth repeating, as is planned in this project. Despite the many promising results in these studies, project scientists concluded that phosphatic clay was not a good choice for local waters because of that specific clay’s undesirable properties, particularly the low level of radioactivity it sometimes contains, its metal contamination, and the strong public concern over the source and use of the material. These and other considerations (including a lack of red tides to test new approaches within the time frame of the project) led to an abandonment of the concept in the US until now. With major developments in the formulation of highly effective clays and extensive studies showing minimal environmental impacts in China and Korea, the time has come for a careful assessment of this mitigation technology for use in the US – hence this project. Does clay dispersal affect toxin concentrations in the water? During the study mentioned above, it was demonstrated that in addition to removing intact red tide cells from the water, dissolved red tide toxin (toxins not contained within the cells themselves) was also effectively removed by the phosphatic clay. The addition of clay alone removed approximately 70% of dissolved toxin in the water, and with the addition of the polymer polyaluminum chloride (PAC; see below) 100% of the dissolved toxin was removed. Since clays all differ in their charge and structure, these experiments will be repeated in the project described here using a new clay, but it is expected that results will be equivalent to, or better than, tests of phosphatic clay. What are the objectives and research plans for this new project? The overall objective of this project is to test the effectiveness and environmental impacts of modified kaolinite as a red tide control strategy, a clay mineral used over the last several decades in China to successfully control HABs. This project will involve laboratory experiments, studies in small tanks or mesocosms, as well as a pilot-scale field study in a contained or curtained-off section of a canal or lagoon. For the latter, we intend to isolate a small area (perhaps 0.5 – 1 acre) with floating turbidity curtains so that the clay treatment can be contained, while also allowing us to examine effects on the water column and the ocean bottom under controlled conditions. Parallel measurements will be made in an adjacent area where no clay will be added to serve as a control. It should be emphasized that the field applications in this study will be in small, enclosed areas—there is no intention at this time to use this in open coastal waters over large expanses of water. Any expansion of the program to larger areas in Florida can only occur once we have collected and analyzed our data from these small, controlled applications and arrive at a consensus that the concept can be valid for larger areas. A broad-scale dispersal effort is far beyond the scope of this project. What clay (and how much) will be used in the current efforts to control the Florida red tide? The kaolinite clay called Modified Clay II was developed to minimize the amount of clay needed for effective cell removal. Where prior studies, including those in South Korea, suggest amounts on the order of 400 grams per square meter (equivalent to approximately 0.75 pounds per square yard or 3,500 pounds per acre), the modified clay can be applied at a rate 50 - 100 times lower, or 4 -10 grams per square meter (35 - 85 pounds per acre). To better envision the amount of material, imagine sprinkling one or two sugar packets on a small card table. One of the objectives of this project is to determine the amount of modified clay that can effectively remove Karenia brevis cells and toxins under red tide conditions, but overall, the amount needed will be much less than the previously tested application, which reduces potential physical impacts to the seafloor. What is modified clay, and how different is it from natural clay? Modified clay (MC) is a kaolinite clay that has been screened and purified in a manner similar to that used to make the clays used for porcelain plates, dishes, and teapots. The composition of MC is as follows: silicone dioxide (SiO2): 45.6%; aluminum oxide (Al2O3): 31.2%; potassium oxide (K2O): 1.8%; iron (III) oxide (Fe2O3): 0.9%; calcium oxide (CaO): 0.1%; magnesium oxide (MgO): 0.2%; sodium oxide (Na2O): 0.02%; sulfur trioxide (SO3): 1.1%; other inorganics (LOI): 16.1%. It has a median grain size (D50) of 23.5 µm. The clay is mixed with a polymer called polyaluminum chloride (PAC), which gives the clay several important properties that greatly enhance its cell-removal efficiency. First, the PAC alters the surface charge of the clay so that it is strongly positive, making it highly attractive to the negatively charged red tide cells. Normal clays, like those from South Korea, are negatively charged, so there is some repulsion of red tide cells that is only overcome by using large amounts of the material. The second attribute of PAC is that it creates long strands or filaments that bridge between particles and captured cells, making a net-like structure that falls through the water, collecting other cells and particles as it falls. This sweep or “net capture” effect greatly improves its removal efficiency and reduces the amount of clay needed. Figure 4 shows a schematic of how this works (Compare to Figure 1). Figure 4. Schematic of the mechanism of action of clay modified with a polymer like PAC. The modification alters the surface charge of the clay so it is strongly negative, thereby attracting negatively charged algal cells. The polymer also has a long chain that bridges between particles and creates a ”net” that captures more cells as it settles to the bottom. What is polyaluminum chloride, and how safe is it? Polyaluminum chloride (PAC) is not a single compound, but rather a family of inorganic polymers containing aluminum, chlorine, oxygen, and hydrogen. PAC was developed nearly 50 years ago and is extensively used in deodorants and antiperspirants, as in water purification as a flocculant, in drinking water treatment processes, in wastewater treatment, and in paper sizing. PAC is often added directly to open surface waters (e.g., lakes) to immobilize phosphorus in bottom sediments, as an alternative to alum (another aluminum compound, which is also used for that purpose. There are many examples of the use of PAC and alum in lake restoration. See here and here. In terms of safety, aluminum is the most common metal in the earth’s crust. We consume it every day, as the metal is found in antacids, baking powder and many other products. It also does not bioaccumulate. PAC specifically meets relevant American Water Works Association AWWA standards (ANSI/AWWA B408-03) and has been certified by the National Sanitation Foundation (NSF) for use in the treatment of drinking water at a maximum dosage of 250 mg/L. In clay dispersal for red tide control, PAC is typically present at approximately 5 mg/L or 1/50 of the maximum allowed dosage in drinking water treatment. In Chinese studies of the possible release of aluminum into the water following treatment, there was no detectable increase in dissolved aluminum. In animal impact studies (also described below), there was no evidence of aluminum hydroxides clogged in fish gills or scallop gill and mantle membrane, nor was there accumulation of aluminum in sea cucumbers after 60 days of exposure to sediments containing modified clay. Dissolved aluminum rapidly forms non-toxic complexes at the pH of seawater. Nevertheless, the possible release of aluminum from the PAC will be carefully studied in this project. Does clay remove everything in the water - i.e., create a biological desert? The clay will not remove only Karenia brevis cells, and so other species may be affected as well. However, as mentioned above, organisms vary greatly in terms of size, swimming ability, and surface charge, and all of these are factors that affect the manner in which clay will attach to them and remove them from the water column as it sinks. A clay treatment will thus leave many species of algae as well as other organisms relatively unaffected following a treatment. Therefore the water will not be perfectly clear after the clay is dispersed and the unaffected organisms will be able to continue to grow and multiply normally. In general, the red tide cells often vastly outnumber other organisms, and thus the largest impact will be on them (Karenia). Here again, the planned study will examine impacts on a range of co-occurring organisms in the water during and after the treatment. What water quality effects occur during clay treatment? It is well known that natural clays are capable of reducing the levels of dissolved nitrogen and phosphorus in water through a process known as adsorption. During clay treatments of HAB species in cultures (see here), modified clays reduced both dissolved and total nutrients in the water: dissolved inorganic phosphorus decreased by 40-85%, total phosphorus by 50-93%, dissolved inorganic nitrogen by 17-35%, and total nitrogen by 17-72 %. In this manner, the clay treatment does not only reduce the number of red tide cells, but can also improve water quality. Another water quality concern is turbidity, or cloudiness. After the initial clay spraying, the water is a milky, white color, but as the clay settles, the clarity increases rapidly. Within 2-3 hours, the clay has settled and the water is significantly clearer than prior to the treatment. Any changes to turbidity are thus short-lived, and similar to the conditions experienced during heavy runoff from land, or from wave-induced resuspension of bottom sediments in shallow areas. What are the impacts of clay when it settles on the seafloor? Laboratory studies of the impact of deposited clay and Karenia brevis cells on standard EPA test organisms showed that the clay plus PAC was generally not acutely or chronically toxic to infaunal amphipods that live in the seafloor (Leptocheirus plumulosus and Ampelisca abdita), grass shrimp embryos (Palaemonetes pugio), and larval sheepshead minnows (Cyprinodon variegatus). The combination of clay, PAC, and Karenia brevis cells when settled over a natural sediment were generally as toxic to the benthic test species as Karenia brevis alone. In other words, the clay and its entrapped cells and adsorbed toxins will not make the situation any worse than with an untreated red tide. Another concern relates to the levels of oxygen in the water, as oxygen is needed by many organisms for survival, and the concentrations of O2 in the water can be altered by the clay treatment, such as by carrying a large amount of red tide cells to the bottom, where they can decay and use up supplies of oxygen in bottom waters. In past field studies with clay in Florida, the oxygen in bottom waters actually increased immediately following the clay treatment, as the clay flocs carried oxygen from the surface to the bottom. What is not fully understood is the effect of this settled floc and red tide biomass on long-term oxygen levels, so this is a focal point of the planned project. This is another situation in which we need to compare the effects of oxygen levels following clay treatment to the situation during a red tide, where dead cells and other debris are constantly raining down to the seafloor, sometimes for weeks and months, also leading to decay, oxygen depletion, and extensive mortalities (see videos above). It may be that the one-time deposition of material following clay treatment will affect oxygen levels far less than is the case with a persistent red tide in overlying waters lasting for weeks or months. 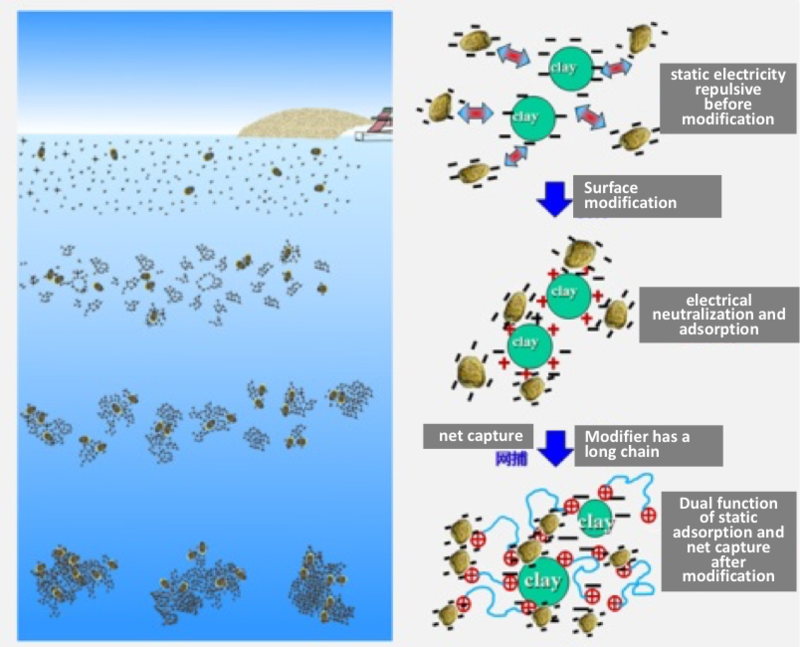 What is the fate of toxins carried to bottom sediments with clay? This is a question that we cannot answer at present, as there have been no relevant studies with the modified clay, but it is also a focus of the current project. Here again, it is important to note that bottom sediments already receive large amounts of toxin during an untreated red tide. A clay treatment might be expected to deliver a pulse of toxin to sediments during the treatment, but over the long term, the total amount of toxin should be lower as there are fewer cells in the overlying waters that can divide again and again to sustain the bloom. Again, this will be a focal point of the current study. What environmental parameters will be measured in this study? How do the impacts of clay treatment compare to the effects of red tide? As explained above, clay treatment of Karenia brevis blooms is not expected to increase or decrease toxicity to benthic or planktonic organisms relative to that attributable to an untreated bloom. How expensive is the clay? The clay costs approximately $600 per ton to purchase. Shipping will add approximately $100 per ton until the time a local supplier is found. At the planned loading rate, the total clay cost would be ~$11- $30 per acre. There would be additional costs for the vessel and labor used for the dispersal.